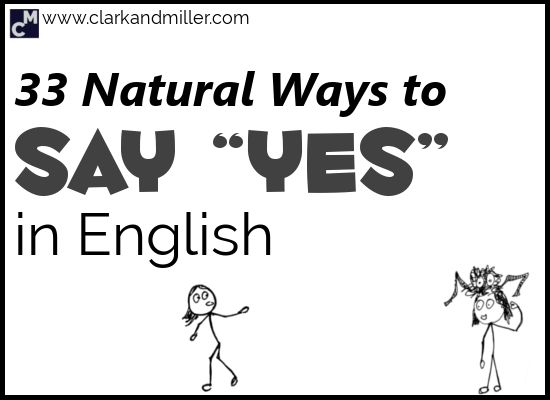 You’re about to learn 33 different ways to say “yes” in English. Also check out How to Answer “How Are You?” + 9 Interesting Ways to Ask It. Why say “yes” all the time when you can say something like “gladly,” “for sure” or even “be my guest”? One of the most common situations where we use the word “yes” is when someone wants us to do something for them. Whatever it is, there are loads of different ways you can say “yes” to requests. This is a very common way of saying “yes” to a request. It does a good job of making everything feel under control. This one is pretty informal. This is like “sure,” but a little less formal. It also feels a bit more enthusiastic and gives off a “can-do” positive energy. As a result, it’s pretty popular with Americans. This is actually an Australian English expression. We all know that Australians are well known for having a rather relaxed attitude towards life. And this expression totally captures that unstressed, chilled-out feeling. When you say this, you come across as an efficient person with your life under control. OK. This one is quite strong in terms of emotional expression. It should be a response to a big request — usually one with emotional connections. So it could work if someone asks you to be the godmother for their child, for example. But it would sound a bit weird if you’re being asked to take out the rubbish. So remember to use it for situations that are likely to delight you, like looking after your bosses seaside mansion for a week. Unless you like cleaning cars, I guess. “All right” is a nice, neutral expression. But be careful because it can sound a bit too uninterested. So if someone’s asking you to do something big, like look after their pet python for two months while they go on a scuba diving holiday in southern Uruguay, then it might seem like you don’t really care too much. But it’s fine if they’re asking you to open the window for them. Again, this one is very neutral, but it can show a lack of enthusiasm in some situations. So, like with “all right,” only use it for boring, everyday tasks, otherwise you might seem insincere. This is a little old fashioned and light-hearted. It’s got a nice, calm and positive feeling to it, though. But you know this one already, right? “Certainly” and “definitely” both mean more or less the same thing. Just a little less informal. Very similar to “certainly” or “definitely,” but this one is a little more enthusiastic. It shows that you really want to help. It can be a nice one to use when you’re with friends and family. It shows familiarity and that you’re comfortable with the other people. In less casual situations, I’d recommend avoiding it. Just in case. Interestingly no one really knows where this word came from, though some theories are quite popular. One theory is that it came from the USA in the 1830s, when it was fashionable to make jokey, misspelt phrases. One of these was “Orl Korrect” (meaning “all correct”). For some reason, people thought this sort of thing was hilarious. Sometimes we don’t say “yes” in order to give information to someone. It’s less an exchange of information and more of a bonding experience — a process that brings people closer together. When you really, really agree with what someone says (or you want to pretend that you do), then use this! This one also shows strong agreement with someone. This one completely depends on what you’re agreeing on. Why? Because “He goes …” is in the present simple, so you need to use the correct auxiliary verb in your answer (“does”). What’s an auxiliary verb?Click for details. I live here. – I (do) live here. She met him at an elephant factory. – She (did) meet him at an elephant factory. This is a good little phrase that you can use to show agreement without interrupting the other person. Next time you’re listening to people speaking English, try listening to the sorts of back channels they use — it’s fun. Everyone uses slightly different ones. This one is strong, but when the person you’re agreeing with says something that you really, really agree with, then it’s time to bring out the big guns and use this one. This one is particularly informal and not very strong. “Yeah” is just like “yep,” but feels slightly more friendly. It’s often said that vowels carry the emotion of a phrase or a sentence, while consonants carry the meaning. So while “yep” has a short vowel sound and feels quite distant, “yeah” has a long vowel sound and can feel more friendly and human. It’s a nice phrase, isn’t it? We also sometimes want to say “yes” in order to accept an offer. It’s positive! It’s enthusiastic! It’s friendly! This is also rather friendly and enthusiastic. As we discussed earlier, “yep” is fine, but it can be a little distant and unfriendly. But if you’re comfortable with the person you’re talking to, then it’s OK.
As I mentioned earlier, “yeah” is similar to “yep,” but is more friendly. And because of that long vowel sound, you can use it to express more emotions. This is very enthusiastic and shows that you really appreciate whatever it is that you’ve been offered. But remember: there are different ways to use it. But if they’re offering you something physical (usually something you can have), then you’d say “I’d love some!” (for uncountable things, like carrot cake) or “I’d love one!” (for countable things, like a cup of green tea). I like the way this one feels. We also need to say “yes” to let people know that they’ve got something right. Simple, to the point and requires very little effort. It can sound a bit short in some situations. We talked about this above. While it’s quite informal, this is not the friendliest phrase. But it’s efficient. Again, this one is like “yep,” but because of the long vowel sound, you can inject more feeling into it. Try it! There are probably several ways you can say “yeah,” and it could have a slightly different meaning each time depending on how you pronounce the vowel sound (longer, shorter, higher pitched, lower pitched, going up in pitch, going down in pitch, etc.). And what about when someone asks you for something? You need to say “yes” then (unless you don’t want to give them what they’re asking for). This one is particularly polite, but I guess in these situations, being polite is a good idea. We use language to get past those awkward little situations that come from wanting something from someone else. This one is quite casual — it’s the sort of phrase I’d use if someone wanted to take the seat next to me on the train. It only works with requests like “Is it OK if I …” — when someone is asking permission to do something, not when they’re asking for something from you. When someone says this to me, I feel completely at ease. Again — only use this when someone is asking if it’s OK for them to do something or to take something from you. This word keeps coming up, doesn’t it? Well, it’s obviously a very useful one. As mentioned above, be careful with this one. It could seem a little rude in the wrong situation. Again, although this can be quite friendly, make sure you’re not in a situation where you need to be very, very polite. Finally, this one is also a bit like “yep” and “yeah” — it’s rather informal and casual. If you’re giving permission for something small, like opening the window, then it’s … well … it’s fine. But if someone wants to take you out to the best restaurant in town, then you might want to sound a bit more enthusiastic. Unless you really don’t like restaurants. In which case, you could always say “no” instead. Sometimes we want to say “yes” in order to accept a suggestion. It’s another simple and efficient word — not too formal, not too informal. This one isn’t massively enthusiastic but has a nice, agreeable feeling to it. It’s quite enthusiastic and shows that you’re quite strongly interested in the suggestion. As always, “yep” is a little short … a little impolite. But efficient. … and “yeah” is also quite informal but could be more friendly depending on how you say it. This is like “all right” — it’s agreeable but not very enthusiastic. This is similar to “OK.” Save it for the less exciting things in life. It’s friendly and shows genuine, positive enthusiasm. Unless you’re the sort of person with a sense of irony in their humour. In which case, this could be quite a funny phrase to use. OK — now you have some new and interesting ways to say “yes” in English. Yes? Let me know in the comments. Great as always! Keep up the good work, please! Never heard it before! And it’s excellent! I’m going to try and use this in future conversation ….